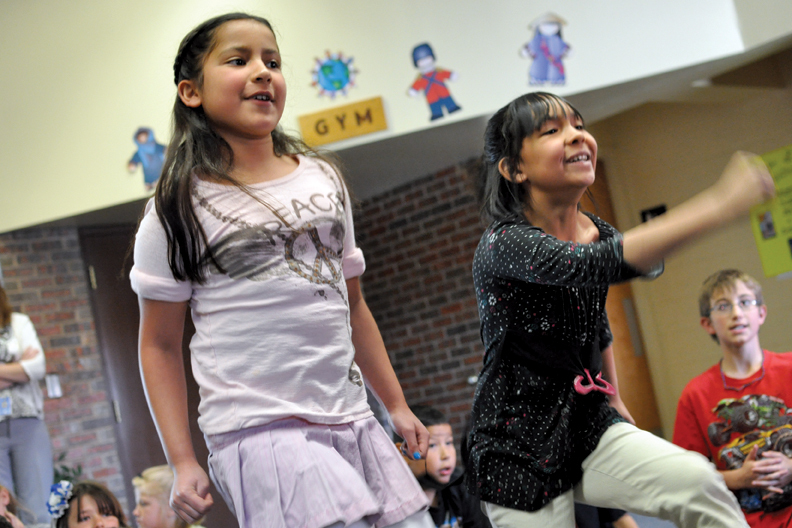 Sunset Elementary School third-graders Alexei Reyes, left, and Guadalupe Loya compete in a sprinting event on an Xbox Kinect on Tuesday at the school. Sunset Elementary classes are vying for the best scores in five sporting events during Sunset Olympics, a two-week project designed to spark children’s interest in the 2012 Olympic games. Aaron Colby set his face in a resolute grimace Monday as he trotted through the Sunset Elementary School gym, a torch clutched in his determined hands. The Sunset Elementary kindergartener wasn’t carrying the real icon of the Olympic games. A paper cone with red and orange construction paper flames took the place of the torch that will signal the beginning of the international sporting event this summer. Aaron didn’t waver as he carried the torch dutifully to Moffat County High School track athletes, who would run it around the gym before the finale. This was the Olympics, after all, or at least one elementary school’s attempt to recreate it. “Because this summer is the 2012 Summer Olympics, we wanted to create an interest for the kids because a lot of them really don’t know much about the Olympics,” said Misty Jones, Sunset Elementary fifth-grade teacher, about the school’s two-week project that kicked off Monday. Each class adopts a different country to represent as they compete in five events: discus, hurdles, javelin, a sprint and soccer. The top score from each class is recorded on a scoreboard in Olympic Stadium — otherwise known as the Sunset Elementary School lobby — and at the end of the unit, the scores will be tabulated to determine which class takes gold, silver and bronze medals. Teachers had to pare down the sporting events to fit the abilities of young athletes. Instead of flinging a javelin or hurling a discus, students compete in all events via a game on an Xbox Kinect loaned by Sunset Elementary first-grade teacher Cheryl Arnett. Misty Jones and Amy Jones, a Sunset Elementary kindergarten teacher, were pivotal in launching the project. “We thought this would be a fun way to end the school year, but also to incorporate math and physical education together and make it a whole school-wide activity,” Misty Jones said. Teachers can use the scoring element of the games to explore a spectrum of math concepts, including time and averages, she said. “It’s up to the teachers … how much they want to dive into this,” she said, but several of her colleagues are using the project to teach students about the countries their classes have adopted. “I can tell you that my son Owen’s class, they picked Germany, and he’s been coming home counting in German,” Sunset Elementary Principal Zack Allen said. From what he could tell before the torch lighting ceremony Monday afternoon, the project was generating buzz among staff and students. Students’ excitement was audible as each class paraded into the gym for the ceremony, waving small paper flags from their countries as their classmates cheered. The near-deafening roar inside the gym was only a taste of what spectators can expect to find at the Olympic opening ceremony in London this summer. Still, teachers hope it’s enough to pique students’ interest in the games and maybe give them a glimpse of the bigger world around them.